Registration Validator is a plugin that helps you to fight against spammers. With Registration Validator you can block not only usernames or IP addresses but also you can block domains and subdomains. Blocking an entire domain (including subdomains) is very easy. Just put before the domain a full stop (e.g. “.webdev3000.com”). Any entries without a leading full stop (period) are treated as specific (i.e. only that domain and none of its subdomains are blocked) . To block an IP or IP ranges replace part of the IP with * to match any similar IP (e.g. 192.168.*. * will match 192.168.1.1, 192.168.3.4, and any others beginning 192.168). 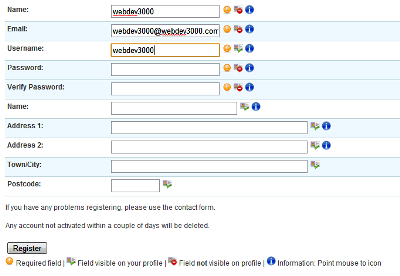 Another feature of Registry Validator is the ability to check email addresses for valid DNS entry. Registration Validator offers Botscout integration. Botscout prevents bots from registering on forums, polluting databases, spreading spam, and abusing forms on web sites. This is done tracking tracking the names, IPs, and email addresses that bots use and logging them for future comparison. Using Botscout the IP and email address will be checked and blocked if the IP and email are in Bouscout database. With Registry Validator you can check email credibility against disposable hosts and fake accounts using http://undisposable.net/. This way you can prevent userbase contamination by fake accounts. Compatibility: Joomla, Community Builder( version 1.2), AjaxRegistration and Virtuemart . as http://undisposable.net/ is down I established a new service which helps to check if a subscriber tries to use a trash-mail address.